Here is a book almost as rare as its author, Emily Dickinson (1830–1886). Drawn from the “envelope poems” of her final period of writing, the book reproduces full-color photo images of those envelopes (both sides) and, for the reader’s sake, offers a light type transcription of her uniquely handwritten poems. 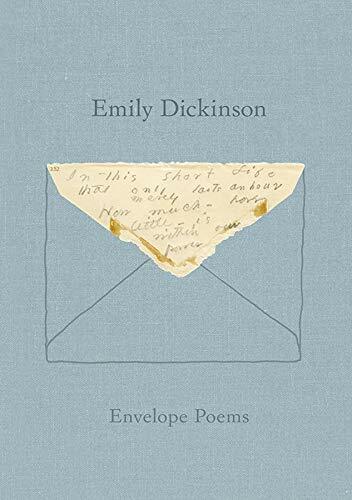 Emily Dickinson: Envelope Poems makes available in a less expensive format select poems from Gorgeous Nothings: Emily Dickinson’s Envelope Poems (2013) by the same editors Jen Bervin and Marta Werner and produced by Christine Burgin Publications. This year also brings us another facsimile work in Emily Dickinson’s Poems: As She Preserved Them Annotated Edition edited by Cristanne Miller (Belknap Press, April 2016). And if one needs a new bold literary biography, we have Jerome Charyn’s The Loaded Gun: Emily Dickinson for the 21st Century released in March by Bellevue Literary Press. One can actually sense Miss Emily sitting by the upstairs window of her Amherst home and dashing off the poem she has been carrying in her mind on the closest thing possible…a nearly discarded envelope. And her positioning of the words and the forced conciseness of the paper itself play in our vision of her as person and poet still in her powers. There are many of these terse and witty observation poems , and as always Dickinson poems of intricacy of seeing things different and anew (spacing the author’s). Of course no Dickinson book of poems would be complete without her haunting thoughts on death made particularly relevant by her nearness to it. This beautifully executed book of poems truly needs to be seen and held in the hands as a piece of visual art. It contains the essence of a poet who for over a century has informed and delighted us with her fierce charm and her oh, so memorable lines. It truly is a gift from Miss Emily.